One of the (incredibly many) advantages of 3D printing is the ability to minimize waste material. Traditional methods of manufacturing often start with a solid block of material and eat away at it until the desired shape is left over. 3D printing offers us the inverse: starting with nothing and adding the exact amount of material required to build up the desired shape. To push these concepts of lean manufacturing even further, our team at 3D Print Western is investigating 3D printed threads to avoid unnecessary post processing, material waste, and human error. Read and utilize our results below in your own 3D printing adventures! Rather than starting with a small hole and utilizing traditional tapping techniques to cut threads in, 3D printed threads start with a larger hole and build threads outwards. The effect is the same, but once again, 3D printing is changing the way we play the manufacturing game. The Setup: A 2” diameter disk with 8 holes of incremental sizes was 3D printed with ULTEM on our Fortus 900mc with a layer resolution of 0.010”. We chose ULTEM because it is the strongest FDM thermoplastic available, and we wanted to mimic the ability of metals to have finely threaded screw holes. 4 holes were left as simple nominal sized holes to be tapped (the control). The other 4 holes were threaded using Solidworks 2016’s new thread feature (also achievable with the original method of using a helix sweep to create threads). The screw intended to fit these holes was a 0.250” finely threaded screw (28 threads per inch). 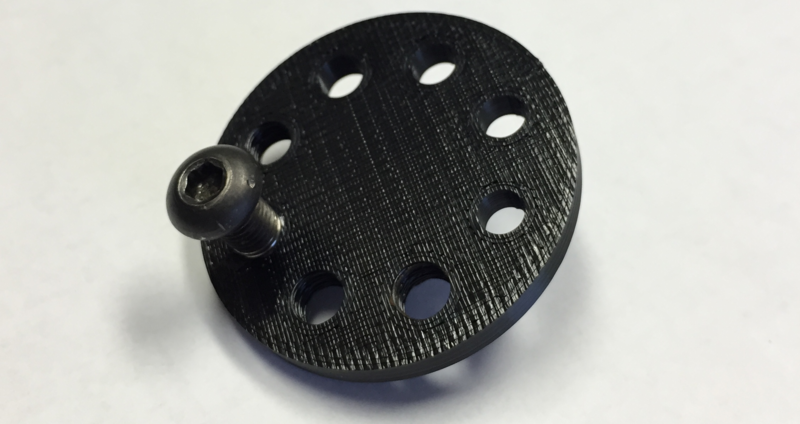 The nominal diameters of the holes with 3D printed threads were 0.240”, 0.234”, 0.226”, and 0.220”. The Test: A standard ¼ “ finely threaded screw was screwed into each hole. The Outcome: The 0.226” and 0.220” nominal hole sizes were too small. The screw became cross threaded every time it was attempted. The 0.240” and 0.234” both worked, with the 0.234” being optimal for a tight fit. The threads performed even better than expected, working as good, if not better, than the manually tapped threads. The fine ULTEM threads refused to break even when only a few threads were in contact and put in tension. The Recommendation: If you’re using a screw of similar size, try creating a nominal hole that is 0.015 less than the size of screw and use Solidworks’ new thread feature! A coarse 3D printed thread is recommended over fine threads to add robustness and prevent thread breakage. If you test it out yourself, leave us a comment and let us know how it goes! If you have a prototype that you want to have threaded holes but you’re not sure how, reach out to our team and we’ll help you out! I have always wondered how to find effective ways to reduce the amount of waste with my 3d prints – thanks for the great tips, I will implement them and will let you know if I get stuck.